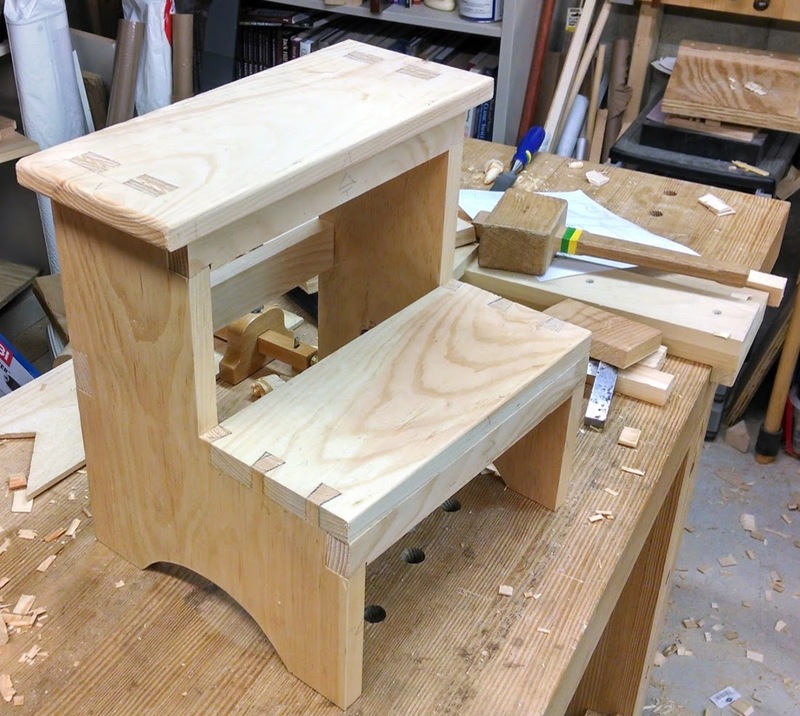 Prototype step stool complete. There are a few minor joinery changes from the plan (can you point them out?). I've left the cleanup for later so everybody can see the marks and how to deal with gaps. It's been nearly two months since my last post. Several things have been competing for my time and energy. I got a new job, I've started learning to play electric blues guitar, I'm adding a student area to my basement workshop, and I built the prototype step stool for the class, which started yesterday. Changing jobs is a huge investment in time. It requires a lot of study and preparation in addition to going on interviews. Along with a current job, that doesn't leave much energy for woodworking. It all started when an Apple recruiter contacted me on LinkedIn. I wasn't looking for a new job, but when the most profitable company in the world knocks, you answer the door and see what they have to say. I did the phone interviews, then flew out to Cupertino for a day of on-site interviews. Unfortunately, they didn't make me an offer, which is just as well, because the real estate situation there is absolutely insane, a financial meat-grinder. While the job would have been cool, the rest of our lives would have been turned upside down, shaken, stirred, and squeezed dry. But the die was cast, and I've found that once I start thinking about changing jobs, it becomes inevitable. Monday I started at Sonos in Cambridge, the leading maker of wireless speaker systems that stream from your home music library and all the Internet music services. You may have seen their ad during the Super Bowl, which I took as a very positive sign of growth investment. These Bloomberg articles provide some interesting tidbits about them: Sonos Say Sales Doubled as Home Sound-System Market Grew, Microsoft’s Xbox Product Chief Joins Speaker-System Maker. This will put my networking, media streaming, multithreaded, object-oriented, embedded system experience to use. Since their controller apps run on Android, iOS, Mac, and Windows, I'll get to work in four different OO languages at once. If this sounds interesting to you, they do have other jobs available. 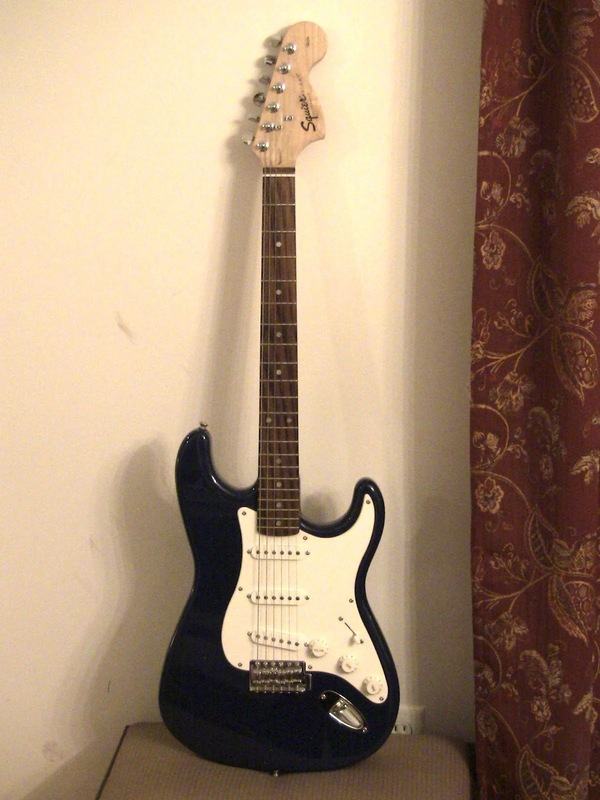 My new (to me) Fender Squier strat (looks black in the light here, but it's blue). I've wanted to play guitar almost as long as I've wanted to be a woodworker. I tried to learn after high school on my Dad's old Gibson LG-O acoustic, but never got very far. I didn't have the patience. You know how I compare learning to work with hand tools with learning to play an instrument? Well, now it comes full circle, and learning to work with hand tools has taught me the patience to learn an instrument. My wife had wanted to learn to play dobro, and found a great teacher in Framingham, George Ede. George seems to know everyone in the music business in the Boston metro area after over 40 years. Since he also teaches guitar (and anything else with strings! ), I was inspired and signed up for lessons. I bought a used Fender Squier stratocaster and practice amp from him. Unfortunately, the logistics didn't work out, but George got me off to a good start and showed me I could do it. I'm learning chords, scales, and riffs. My goal is to be able to play at some of the area blues jam sessions in a year, like Sunday nights at Stone's Public House with Pete Henderson. Pete is well-known in the area for encouraging new musicians; when I introduced myself and told him what I wanted to do, he said, "Just let me know when you're ready!" As you might expect, music is a big thing at Sonos, and it turns out one of the people there owns Smoken' Joe's BBQ and Blues with her husband (where Pete also plays). I bought a really cheap used Squier strat from Guitar Center that I hope to keep at work so I can practice at lunch with a headphone amp. One of my coworkers told me there are a couple of jam groups there who welcome all comers. 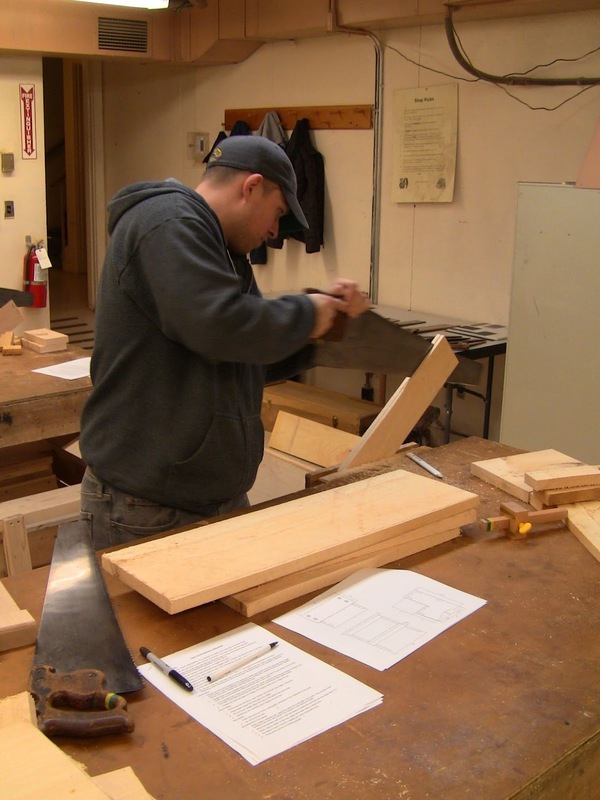 The Close Grain School of Woodworking is changing. While it was fun teaching in the old barn in Pepperell, I ended up getting more individuals than groups, and the logistics got too tight getting there from work in Cambridge. Instead, I've moved the benches to my basement workshop, where I've setup a student workspace. It just needs a little final cleanup and organization. More on this in upcoming posts, including another use for the space, where every Wednesday will be Veteran's Day. My class at Cambridge Center For Adult Education has 5 students. I started with hand tool safety (see below) and went over some basic properties of wood, talking about grain, wood movement, and rough vs. fine work, then we got busy breaking down the raw lumber. As usual, I brought rough-milled white pine from Parlee Lumber in Littleton. Everybody got an 8' piece of 1x8. After cutting around the knots, that leaves enough clear wood for the step stool and various practice exercises in sawing, planing, and joinery. I explained the difference between rip and crosscut saws, then had them do practice cuts, including deliberately using the wrong saw to see how it feels. Once they had the hang of it, they rough cut their boards on sawbenches and sawhorses. 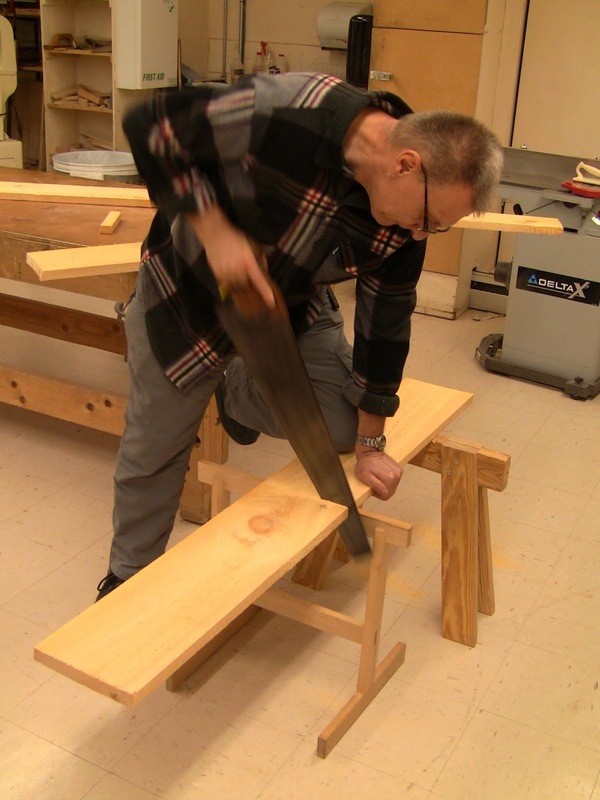 Paul crosscutting on a pair of sawhorses. 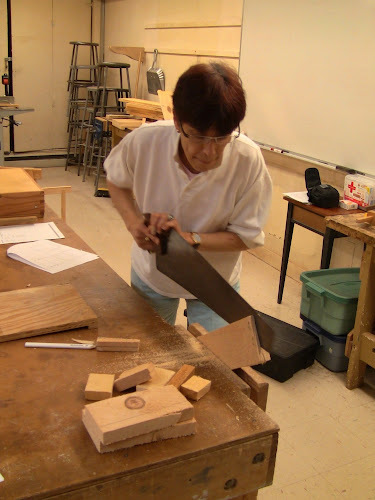 Anita finishing up a crosscut on a sawbench as Becky marks a piece. Matt ripping a narrow strip while Cheryl crosscuts to remove a knot. I showed them how to cut the smaller pieces on bench hooks and vises, then demonstrated resawing a small piece. While the step stool doesn't call for any thin pieces, resawing is an important skill to have, so they all cut a piece down and resawed it. Matt resawing a long piece. I finished up the class with a demonstration of chisel sharpening, using Norton oilstones on my portable sharpening station. In the next class, we'll start dimensioning the pieces with handplanes in the FEWTEL sequence, and I'll demonstrate saw sharpening. Since several students are interested in setting up workspaces, I'll bring in my folding apartment workbench and the tools I bought for it. Safety is YOUR responsibility. Your attention to safety is the best way to prevent injury. Handle and use tools in a safe manner at all times. If you aren't sure, ask the instructor. Splinters and small nicks and cuts are common, even for the most experienced woodworkers. Tweezers and bandaids are available in the first aid kit. Report all injuries to the instructor, no matter how small. 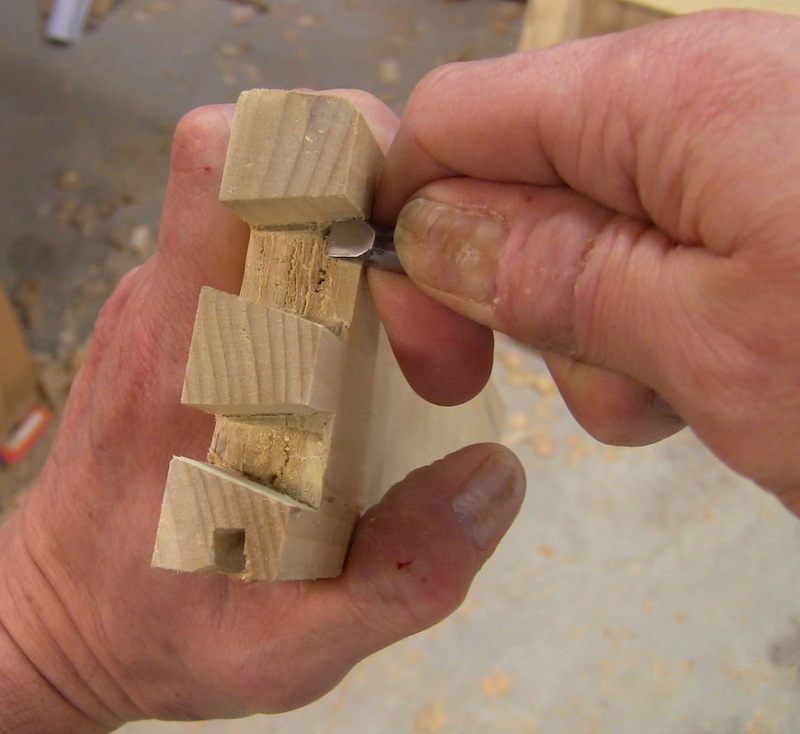 Many hand tools have extremely sharp edges, teeth, or points. Be aware of them at all times. Be aware of the cutting path of a tool. This includes the exit path of the tool. Be aware of the path a tool may take if it slips or the workpiece breaks off unexpectedly. Keep your free hand (the hand not holding the tool) out of the path of the tool. Keep your body out of the path of the tool. If a tool falls, stand clear and do not try to catch it. A damaged tool is preferable to an injury. Do not use a dull tool. Dull tools slip on the work more easily, and you need to apply more force to make them work, increasing the risk of an accident. Bring dull tools to the instructor's attention. Chisels are the most dangerous tool because of their long length and fully exposed sharp edge and corners. They are capable of penetrating and cutting skin, muscle, tendons, blood vessels, nerves, and bone. Handle and use them with care. Except when using a stopped grip, do not have your hand or any part of your body in front of the chisel, and do not direct the chisel toward any part of your body. For a stopped grip, choke up on the end of the chisel, exposing only enough length of blade to do the work. Your fingers around the end act as a stop, preventing it from going further. This is a stopped grip, holding a narrow chisel to clean out a dovetail. Even though my left hand is close to the sharp edge, it is safe because it is below the dovetail, out of the direct path of the tool, and my right fingers are wrapped around the chisel, exposing only the end and limiting it to within the thickness of the wood. Control the force and path of a chisel. If it requires extra force, it may be dull. Plane irons are like short, wide chisels, but only the very edge is exposed. Keep fingers away from the plane iron edge. Do not brush fingers down the sole of the plane from toe to heel. Handle the iron carefully when setting the cap iron. Keep free hand out of the cutting path, including on the underside of the work. Do not force the saw. When using a marking knife, keep free hand out of the path of the knife. This includes when holding a rule down and using it as a guide to mark along its length. When boring holes with drill or awl, be aware of where the point will exit and keep clear of it. When using a mallet or hammer, keep other hand clear of strike point. Be aware of pinch points in clamps and other articulated tools. Avoid sharp points on marking gauges. Looks like you've been busy. Congratulations on the new job and good luck with the school.